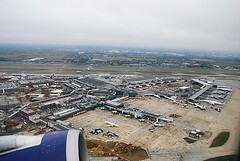 The UK's, and the world's, busiest international airport. The airport has five terminals (with plans for further development) and serves over 180 destinations in over 90 countries. It is located a little under 20 miles west of central London, just inside the M25 orbital motorway. Last edited 2016-12-31 19:58:23 (version 16; diff). List all versions. Page last edited 2016-12-31 19:58:23 (version 16).